In this Oct. 13, 2016, file photo provided by U.S. Marine Corps, two F/A-18D Hornets with Marine All-Weather Fighter Attack Squadron 533 approach a KC-130J with Marine Aerial Refueler Transport Squadron 352 during a Special Purpose Marine Air-Ground Task Force - Crisis Response - Central Command aerial refueling exercise in undisclosed location. On Thursday, Dec. 6, 2018, two American warplanes crashed into the Pacific Ocean off Japan's southwestern coast after a midair collision, and rescuers found one of the seven crew members in stable condition while searching for the others, officials said. 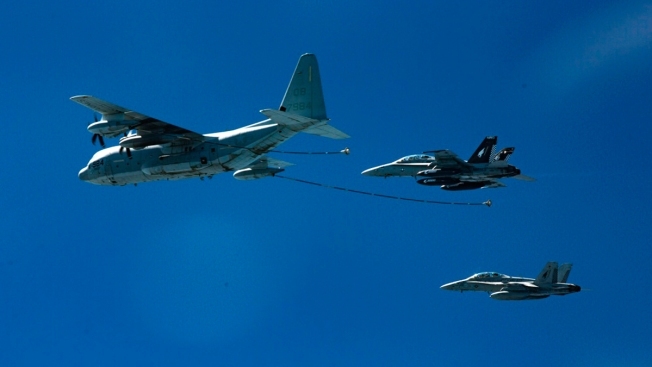 The U.S. Marine Corps said that the crash involved an F/A-18 fighter jet and a KC-130 refueling aircraft during regular training after the planes took off from their base in Iwakuni, near Hiroshima in western Japan.